Why use images to study plankton? Although ocean science has made many great advances, many biological processes are still poorly understood. In the sciences generally, a common theme is using new technology to examine patterns on smaller, more fundamental scales (e.g., DNA technology in biology, nanoparticle physics), with the goal of revealing underlying mechanisms. Plankton imaging is a method to examine patterns of organisms on a smaller scale, giving insight into how these organisms live and interact with each other. In addition, many planktonic animals are fragile and easily destroyed by plankton nets: the traditional tool to study plankton distributions. These plankton nets also suffer from the problem of having to sample over large portions of the water column, so an oceanographer might use a single net to capture copepods and shrimps and assume that these organisms co-occur if they appear in the same sample. 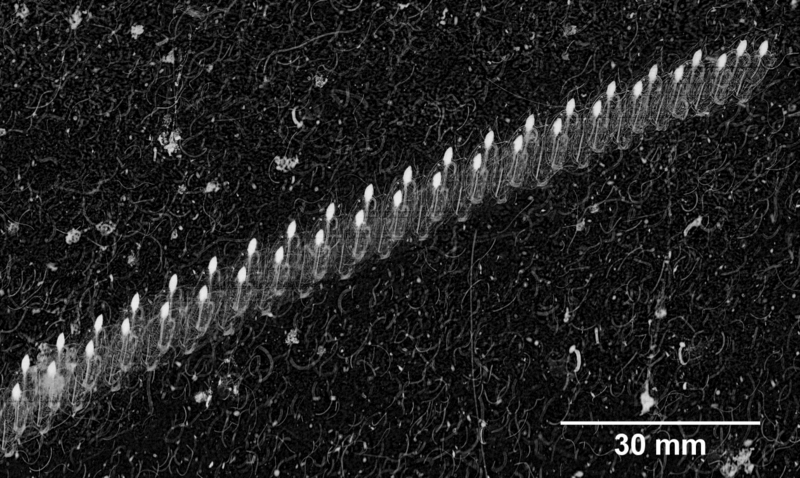 However, it is entirely possible that the organisms are confined to discrete thin layers that do not overlap spatially. An imaging system can distinguish between these two scenarios, while a plankton net cannot. Images also provide information about the natural orientation of plankton, which can allow us to make predictions about their movement and feeding strategies. 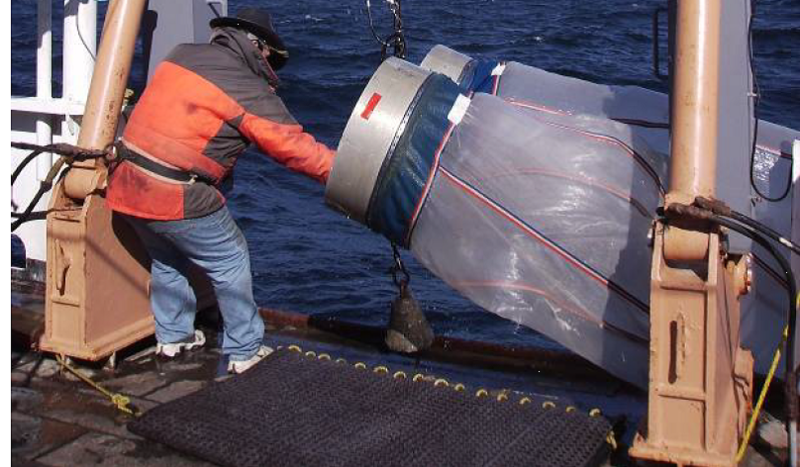 The bongo net is a traditional tool of biological oceanographers but is biased toward plankton with a hard exoskeleton (crustaceans) (Image source: NOAA Cruise DE 10-09 Report). When we think about the future of our planet, climate change and predicting its effects are of great concern. In order to make meaningful predictions about a system, you need to create a mathematical model. One of the most important aspects of any model is the initial conditions and baseline variability. For many planktonic animals, especially jellyfish, we do not know their abundance, variation, or how they interact within the oceanic food web, which is all crucial information for predicting the future of our oceans under climate change conditions. Using an imaging system like ISIIS can lead to better population estimates of many different plankton types, and this information can complement many types of oceanographic studies. Fine-scale data can improve estimates of feeding and encounter rates for planktonic organisms, which is critical to our understanding of the oceanic food web. A colony of salps such as this one would be destroyed or broken up into individuals if sampled with a net system. The in situ image in this situation gives information on the asexual budding of this fast reproducing phytoplankton grazer. When compared to plankton samples preserved in ethanol or formalin, image data provide distinct advantages in data processing and collaboration. For one, oceanographers can tackle age old questions like what are the biological and physical drivers of plankton aggregations and dispersal, and how do plankton aggregations impact the populations of wild fish, a multi-billion dollar global industry? The ‘digitization’ of biological data improves the ability to share data, fostering collaboration among ocean scientists with differing expertise. Having these images available on the internet (through a database server) increases the accessibility of biological oceanography to students, teachers, and the public. It is our hope to one day have these images available to the public, so everyone can gain an appreciation for the diversity of life in the ocean and perhaps use them to supplement science classes. The Zooniverse and Citizen Science is a great start to achieving these goals of making ocean science more “open access,” and we are so appreciative of your help!